Phoenix Gym is an independent gym in the heart of Norwich. They needed a website that would promote all the gym has to offer and attract new members to join the club. The gym already had a well-recognised logo but needed to extend the branding further to incorporate their online assets. 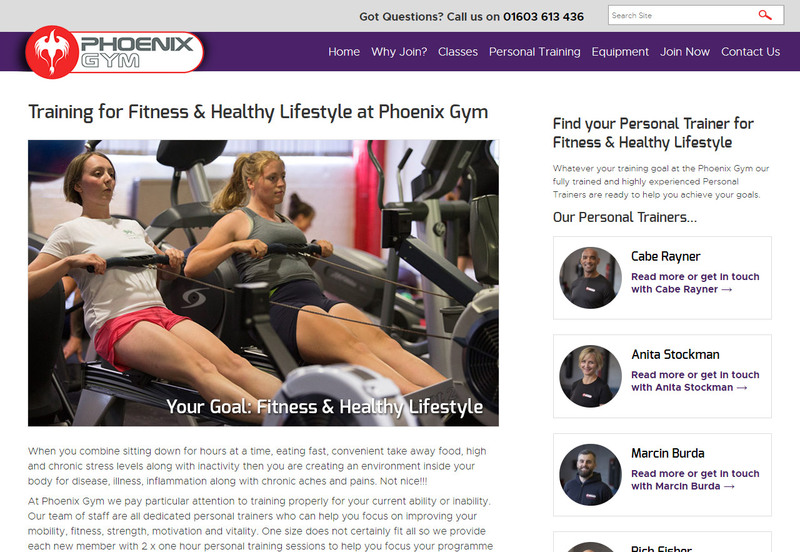 Phoenix Gym had an existing website that had been built on the Wix platform, it was hard to customise to match their branding and Wix couldn’t offer that advanced functionality that the gym required to move forward with their business plans – such as the storing and sorting meta data and handling different content types. The client was keen to have a site that could be updated by gym staff to advertise the latest offers and gym developments, since the site was to be a key tool in attracting new members to join. 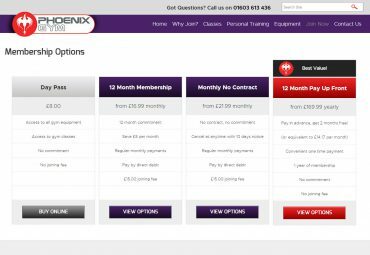 Phoenix Gym needed to make potential gym goes aware that the club had changed ownership and with that ownership change there had been a change in the values and proposition of the business. They had a phased plan of investment for the club, meaning that there would be new equipment and services to promote so the site needed to be extendable and able to grow with the business. In particular they wanted to attract more female members to join the club. 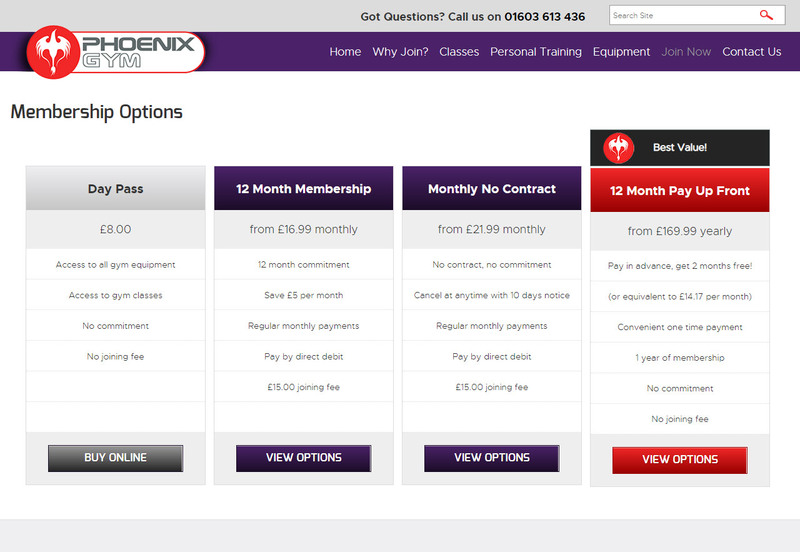 Phoenix Gym is also the home base for many of Norwich’s top personal trainers. The site needed to promote their talents and varied training specialities, giving potential personal training clients the ability to contact Trainers through contact forms on the website. We first looked at the existing branding of the gym. The logo was iconic and required no adjustment, but heavy use of red, black and grey in the brand colours and within the physical premises of the club had led to the brand identity (and the gym) having a very masculine feel. To soften the masculine edges a new brand colour of purple was introduced to the colour palette, along with secondary tints of lilac that were used, along with the purple, in printed materials. Whilst working with the client defining the brand of the gym it became clear that the gym had strong brand values – it was a friendly, genuine place where everyone, regardless of fitness or physical ability is welcomed, accepted and respected. It was important to reflect these values in the brand identity, so a decision was taken to not use stock photography and to build a photographic library of images taken within the gym itself, of the gym’s equipment in use by the gym’s members. These images reinforce the independent nature of the gym and show “real people” doing “real things”. This has been used as a hook to encourage potential members to take gym tours or join the gym, since it was felt that seeing stock images of perfect looking models could be off putting to new gym goers. The basic core of the marketing effort was that potential members just need to visit the gym and see for themselves what it offered. To this end a “Book a gym tour” contact form has a prominent place on every page of the website. Little Bird’s service has always been very thorough and professional and I am not only very happy with the advice that I receive and the work that is done but also the manner in which it is communicated and delivered. The website was built to support the functions of the gym. 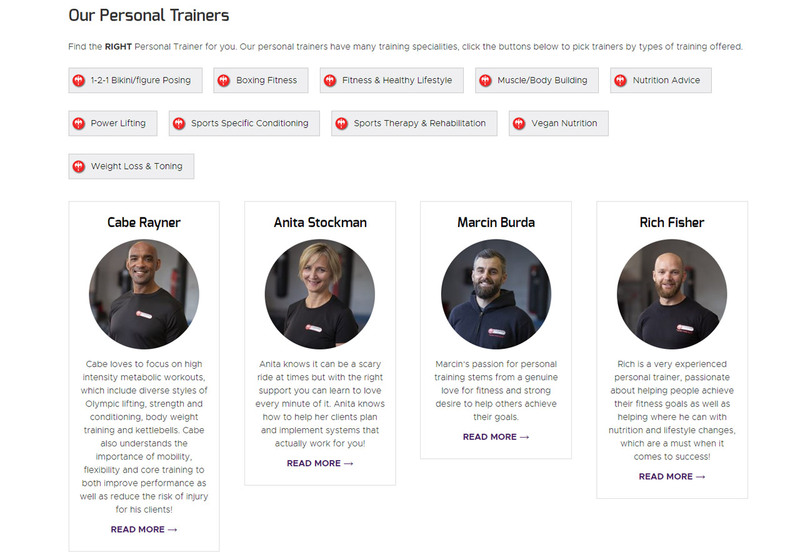 It was important that the Personal Trainers each got a profile page and contact form. Custom post types were used to store these profiles and taxonomies were used to extend the functionality further generating “Training Goals” category term pages where Personal Trainers were listed with the training goal they coached along with descriptions and pictures of the training goal. Custom landing page templates were created to enable social media marketing campaigns to have dedicated destinations within the site, where the marketing messages could be tailored specifically to the campaign along with content specific contact forms within the template. As the gym added group fitness classes to its offering, the site required a section to display the class descriptions and show a timetable. With upcoming class information pulled out in widgets in other areas of the site. 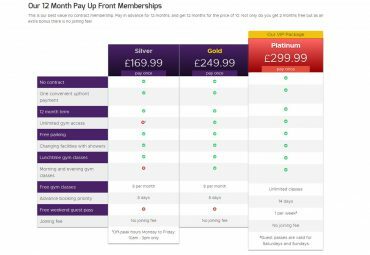 A new membership pricing structure was introduced and it was important that existing members, as well as potential new members, could see the different membership packages on offer, and compare the prices and benefits of each offer. Pricing tables were introduced to show the members the new membership payment options and then comparison tables were added to the site so that members could compare the benefits of the different types of memberships within that payment option. The resulting website is one that has been extended in phases as new business requirements have become necessities. It supports the online marketing campaigns of the client and with well-placed contact forms converts well. The addition of purple to the brand colour palette has been a success, with the colour embraced by both gym staff and members. The gym has attracted a larger percentage of female members and with clearly defined membership packages and comparable benefits the online joining process has become smoother, showing with an increase in membership numbers.